For some, creating email reminders is just as easy as setting up a calendar event or wake-up alarm. However, this is not always the case since there are those who don’t really care much about doing such things unless it’s something of extreme importance. 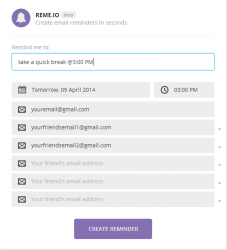 In such cases, it would be best for one to use a “no-frills” type of email reminder app such as Reme.IO. 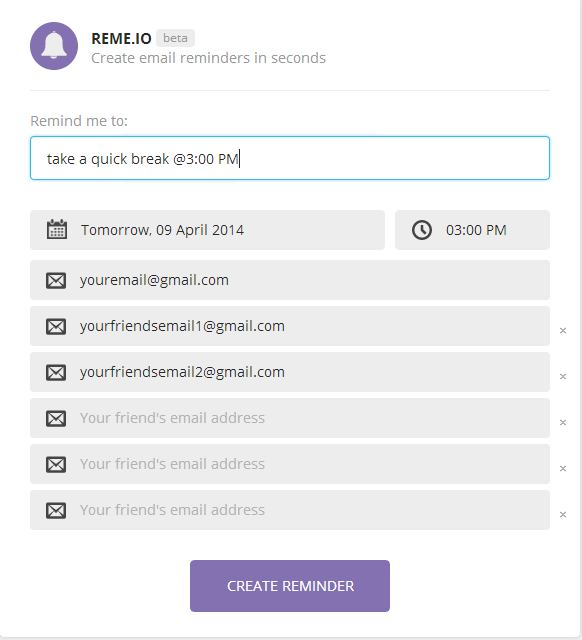 With Reme.IO, you get to create email reminders in just a matter of seconds. It’s a “no-frills” type of web app which doesn’t require you to download or install anything. It won’t even require you to log-in or sign-up. Just create the reminder using the given form, set the time and type your desired email address in the recipient box. You can even send a reminder to multiple email recipients. So let’s say that you want to send a reminder to your personal email address, all you need to do is to type your reminder (ex. Take a break in @20 minutes), fill out the required sections and then click the purple “Create Reminder” box. 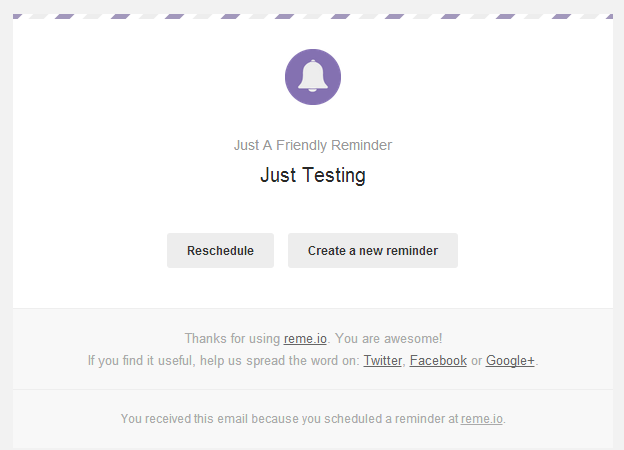 The email reminder will be automatically sent to the email that you have provided. It’s as easy as that. Technically speaking, the said web app has no serious issues but it could have been better if it would allow its users to keep track of their outgoing email reminders. This can be done without requiring the user to sign-in or register for as long as every reminder has a unique tracking URL. 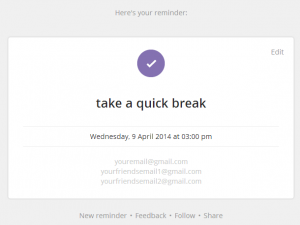 This feature can be very useful for updating or deleting an existing email reminder. Reme.IO is fairly easy to use. It also flaunts a neat and straightforward UI design. With this web app, there’s no need for you to download or install anything on your browser or computer. There’s also no need for you to log-in or register. Just go to the web app’s homepage (see link below) and fill out the required sections in the given form. Once you’re done, simply click the “Create Reminder” button and that’s it. You’re done. Just keep in mind that in the form’s “Remind me to” section, you’ll need to enter a label or message for your email reminder. You’re free to write anything so you can set the web app to remind you to take a quick break in the next fifteen minutes or check your appointment to the dentist at 5 o’clock. Just don’t forget that when setting the time and date for your reminder, you will need to add the @ symbol before the date or time. For example, you can say “take a 15 minute break in @1 hour” or “go to the dentist @5:00PM”. If you follow the format correctly, the said web app will automatically enter the correct details in its time and date section. Apart from this, you should not also forgot to enter the email address for your recipient. This is where you will be sending your email reminder. What’s even more interesting is that you’re allowed to send your reminders to more than one email account. As a matter of fact, you’re allowed to place up to six email addresses per reminder. Once you’re done sending your reminder, there’s really nothing much left for you to do since the reminders will be automatically sent to your email. It should also be noted that Reme.IO uses Mandrill, a reliable email infrastructure service that is owned by Mailchimp. Therefore, there’s no need for you to worry as to whether your email reminders will be kept secured and delivered on time. All in all, I don’t really have any serious issues with this app. It’s just that it could have been much better if it has an option that would allow its users to keep track of their outgoing email reminders. 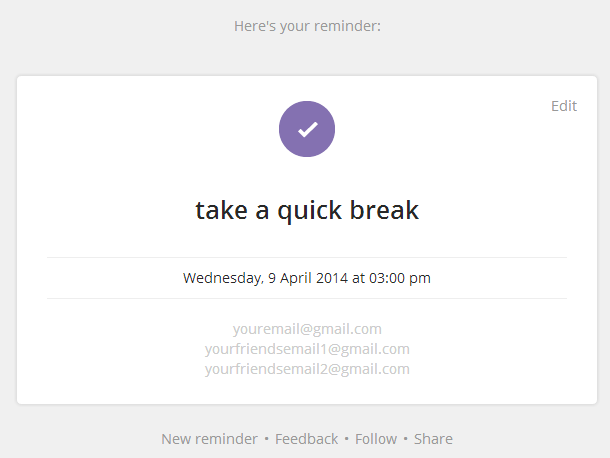 This feature can be very useful for updating or deleting an existing email reminder. Reme.IO is still on beta but it certainly looks promising. Considering its straightforward and hassle-free approach, it is more suitable for occasional use. However, if you want a more advanced tool for sending email reminders, you can try Right Inbox  or Boomerang for Gmail.